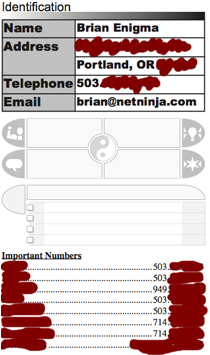 The Title Page is a quick reference of my contact information as well as a phone list for important numbers. It serves three purposes. First, I never remember my own phone number, so it’s nice to have it available at a glance. Second, if my phone (where I keep all of my phone numbers) breaks and I need to call someone for help from another phone, I have important numbers. Third, if I’m found unconscious in a ditch, the authorities can see who to call. I do not offer a downloadable PDF of this Hipster PDA page because it contains my personal information. You should feel free to duplicate the style, theme, or concept. The center section — with Yin/Yang and checkboxes — is for periodically entering and revising longer-term goals. The way I tend to beat up my Hipster PDA, I need to replace this title page every month or so. At that time, I revise the long-term goals on this sheet. The style and format have been borrowed from the Harmony D*I*Y Planner Template. The four quadrants are for physical, social, mental, and spiritual goals. “Spiritual” in this context is not necessarily religious; it encompasses a larger context that could include philosophy and nature. For me, physical might include ongoing yoga or getting back on to the Wii Fit program. Social might be making sure I have enough family time or catching up with an old friend over beers. Mental could include studying or practicing new skills or getting a few more Project Euler problems completed. The spiritual category fits a little less well into my life and would typically include a hike up and around the local volcano to take in the environment.